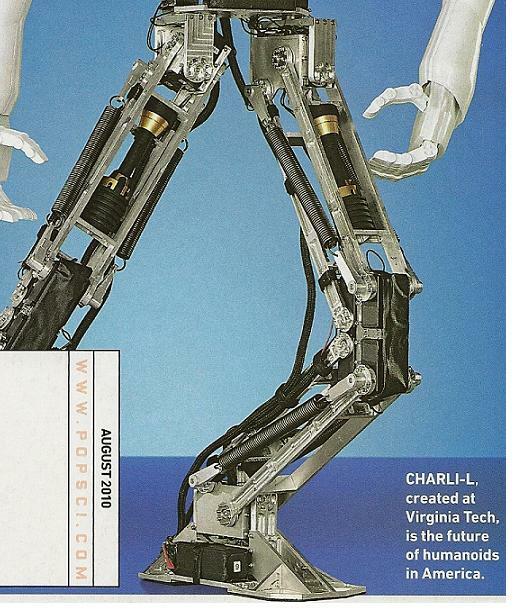 My previous post talked a little bit about RoMeLa's Charli-L, a robotic humanoid from Virginia Tech. Look him up for more information. His main purpose is to compete in the Robocup competitions, but he's also just a robotics development project for the college. Charli-L has a big photo of himself on the front cover of Popular Science's August 2010 magazine. When I was looking at it I became interested in his legs for a couple of reasons. The main shin and thigh components are 4-bar linkages. This seems to be a nice, stable, and simple way to move the legs. I noticed that the bars are at different heights in relation to their pairs, i.e. on the shins, the back bars are higher than the front bars and vice versa for the thighs. I assume that this is so that you can get more rotation out of the linkage because the bars will "run into each other" later than if they were equal. There are large springs on the shins and thighs. These obviously help the motors work the legs by taking some of the effort. But on further inspection, based on what vertecies of the linkages they are connected to, the springs seem to be pulling the legs into an extended, straight position. This might be to help the robot stand better and to help the motors keep the legs from collapsing under the robot like jelly. It might also be because it is easier to control the legs when they are working against a force to bend a leg. Instead of holding the leg precisely, you only need to worry about moving in one direction, even if it's at various speeds or strengths. You don't have to worry about "pushing" the leg in the other direction to make it extend; the spring does that for you. You just have to limit or counteract the spring's force. It's sort of hard to describe and I can't think of a really good example...maybe a pulley with a weight instead of without?...I might think of something later. There are these strange objects whose purpose isn't clear to me. They are inside the thighs and look like heavy-duty actuators. They have gold ends, black tapered middles, and ribbed bottoms. Either they're for structure support or they are actuators. But the structure of the legs don't support these theories. If they're for support, why don't the shins have them. If they are actuators, there is nothing they can move; that thigh part is solid. So just some interesting things to think about.